(Joos F et al., An efficient and accurate representation of complex oceanc and biospheric models of anthropogenic carbon uptake, Tellus, 48B, 397-417, 1996; Shine et al., Alternatives to the global warming potential for comparing climate impacts of emissions of greenhouse gases, Clim. Change, 68, 281-302, 2005, see equation given in figure). Processes not accounted for by the model, including burial of carbon in the ocean sediments from perturbation of the CaCO3 cycle and silicate weathering, remove CO2 on longer time scales (Archer, 2005), but for practical purposes 500 - 1000 years is "forever", as it is long enough for ice sheets to respond and it is many human generations. Indeed, [this equation] should be viewed as an approximate lower bound for the portion of fossil fule CO2 emissions that remain airborne. 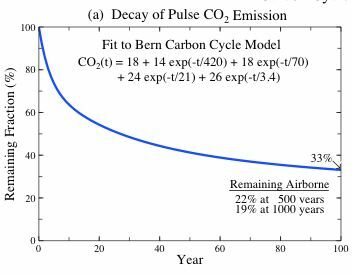 Integration over the period 1750 - 2005 of the product of this equation and fossil fuel emissions yields a present airborne fossil fuel CO2 amount of approx. 80 ppm (Kharecha PA, Hansen JE, 2007). Kharecha PA, Hansen JE, Implications of "peak oil" for atmospheric CO2 and climate, 2007 arXiv:0704.2782v3 [physics.ao-ph] (in cache). Source: Fig. 9a and page 2302 in Hansen J. et al., Dangerous human-made interference with climate: a GISS model-study, Atmospheric Chemistry and Physics, Vol. 7 (2007), pp. 2287-2312 (in cache). (see, e.g., Atmospheric Chemistry and Physics, Vol. 7 (2007), pp. 2287-2312). This is why the residence time of such molecules is generally characterized as a century." Source: Robert M. May (Former President of the Royal Society (2000-2005), Chief Scientific Adviser to the British Government (1995-2000), Oxford, England), How Long Will They Stay (in cache) -in repsonse to Freeman Dyson, "The Question of Global Warming", New York Review of Books (NYBooks), Volume 55, Number 15, October 9, 2008 (in cache). giving a lifetime of about twelve years. This is the average time that a carbon dioxide molecule spends in the atmosphere before it is absorbed by a land plant. I used this lifetime to estimate how long it would take for a major change in the land vegetation to produce a major change in the atmosphere. This calculation completely ignores the ocean. In reality the flow of carbon dioxide into the ocean is about twice as large as the flow into land vegetation. So the lifetime of a carbon dioxide molecule in the atmosphere is really only about five years. Between two jumps into the land vegetation, an average molecule jumps twice into and out of the ocean. I ignored the ocean in my estimate because I was considering only land management and not ocean management as a way of controlling carbon dioxide in the atmosphere. It is possible that ocean management may turn out to be technically more effective, but land management is politically easier because each country owns its own land. Michael D. Lemonick, Freeman Dyson Takes on the Climate Establishment, Interview, Yale Environment 360, 2015 (in cache). 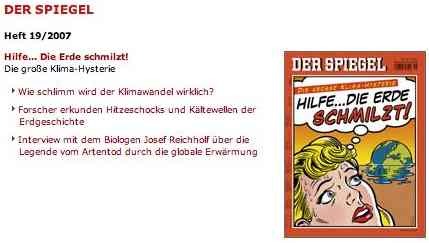 Welches Problem ist vorrangig: die anstehende Klimakatastrophe oder -mehrere Jahrhunderte nach dem Ende unserer CO2-Ära- die fahrplanmäßige Eiszeit? The Anthropogenic Greenhouse Era Began Thousands of Years Ago, Climatic Change 61: 261-293, 2003. Debate over the Early Anthropogenic Hypothesis, 2005. How Did Humans First Alter Global Climate?, Scientific American, vol.292, No.3:46-70, 2005. A bold hypothesis suggests that our ancestors' farming practices started warming the earth thousands of years before industrial society did. Ruddiman doesn't contradict global warming problems. Rather he interprets data over the past four ice ages to try to explain why we are not 2000 - 4000 years into the next one. He argues, based on isotopic data and concentration data for CO2 and methane, that human activities over the last 6000 - 8000 years (the development and spread of agriculture) have prolonged the interglacial period we are in. If Ruddiman's model is approximately correct, then after the hydrocarbon era we are in is over (approx. 200 years) and the oceans have scavenged the greenhouse gases (hundreds to thousands of years), it might be possible to drop directly into another ice age and return to the program already supposed to be 4000 - 5000 years in progress. Ruddiman widerspricht den Problemen der globalen Erwärmung nicht. Eher interpretiert er die Daten im Zeitraum der letzten 4 Eiszeiten, mit dem Versuch, zu erklären, warum wir nicht schon seit 2000 - 4000 Jahren in der nächsten Eiszeit sind. Er argumentiert, auf der Basis von Isotopen Daten und Konzentrationsdaten für CO2 und Methan, daß menschliche Aktivitäten während der letzten 6000 - 8000 Jahren (der Entwicklung und Verbreitung der Landwirtschaft) die zwischeneiszeitliche Periode verlängert haben, in der wir sind. Jedenfalls, wenn Ruddimans Modell in etwa zutreffend ist, dann könnte es möglich sein, direkt in eine weitere Eiszeit zu fallen und zum Programm zurückzukehren, das schon 4000 - 5000 Jahre in Gang sein sollte, nachdem das Kohlenwasserstoff-Zeitalter, in dem wir sind, vorbei ist (etwa 200 Jahre) und die Ozeane die Klimagase aufgenommen haben (einige hunderte bis tausende von Jahren).